And Hernandez is spot-on; consumers are looking for meaningful purchases in these complicated times. Nothing is more real than good old American denim, right? 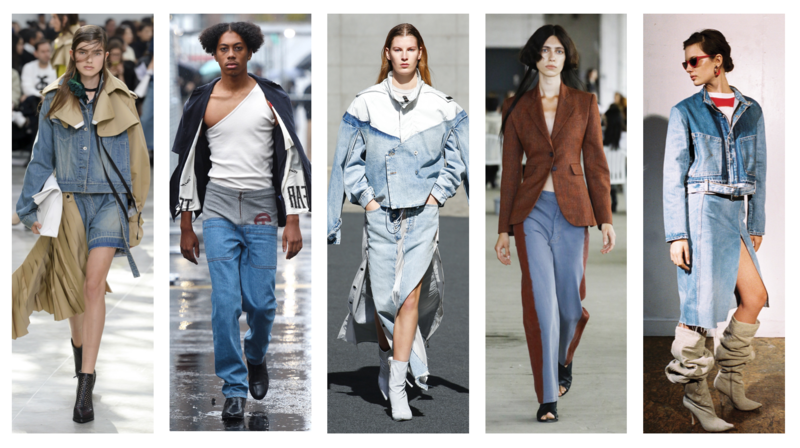 From contemporary names like Provenza Schouler, Stellar McCartney, and Junya Watanabe to established houses like Chanel and Dior, denim was present throughout the global runway circuit. There was laser focus on realness and elevating what we think of as comfort clothing. Whether that be wardrobe staples like denim trucker jackets updated in 80s acid wash finishes or functional classics like cargo jeans or boiler suits in on-trend tie dye patterns, there was a winning formula, both progressive in execution and commercial in style and wearability. Considering current events, there’s a collective feeling that we need all the comfort we can get. 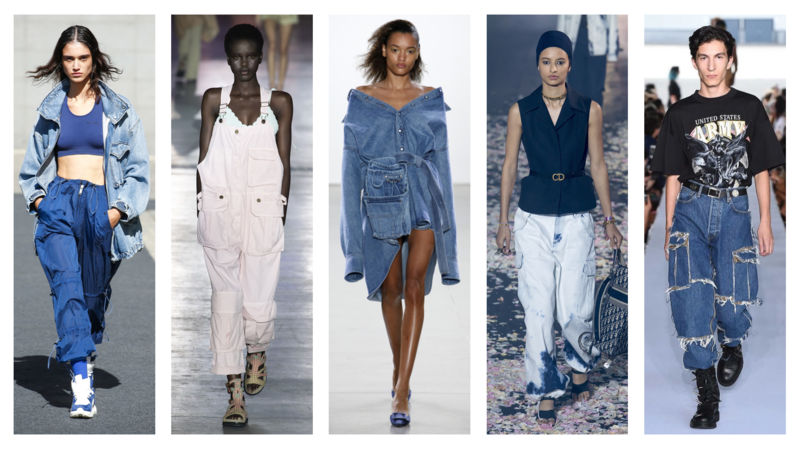 Clothes won’t solve our troubles, but these top denim trends could definitely make life more pleasurable. Its no doubt that designers had California on their mind this season with the endless slew of zesty tie-dye that came down the SS19 catwalks. 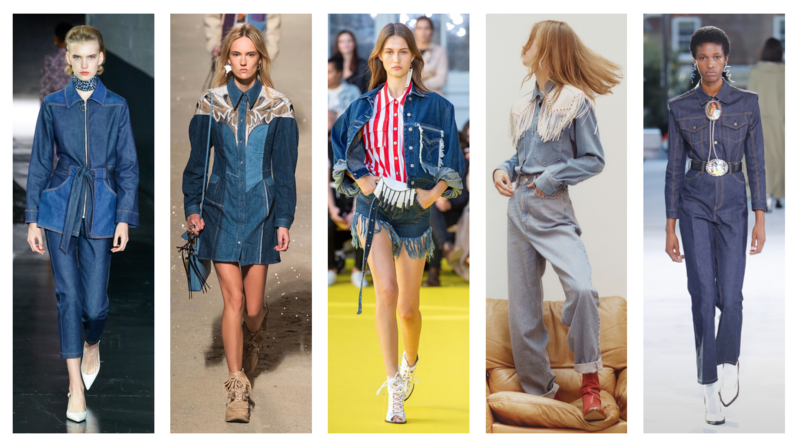 What was once the uniform of Sixties counterculture and a staple for deadheads the world over, has now gone on to headline the catwalks as this seasons most unlikely denim trend. It’s had a contemporary rework, of course. 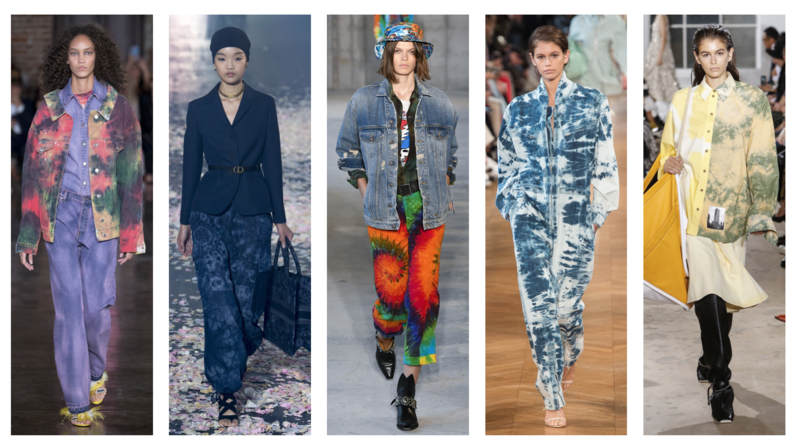 From Stella McCartney’s trend-friendly spectrum of blues, to MSGM’s soft-hued approach and R13’s streetwise handling, this was tie-dye for grown-ups. These designers amongst many others celebrated colour and DIY craft across the board updating truckers and jeans in matching hues for statement head-to-toe looks that will no doubt be a hit at festivals like Coachella next spring. Its been hard to escape wave of 80s styling that has been flooding the catwalks the past two seasons. The era of shoulder pads and crimped hair gets a bad rep, but nearly every trend associated with the time period has found its way back into fashion. Brands like Gucci, Miu Miu and Chloe have all had a helping hand in reviving the era of excess with their Resort collections that breathed new life into everything from power shoulders to sky-high waists jeans and most notably snow wash finishes. 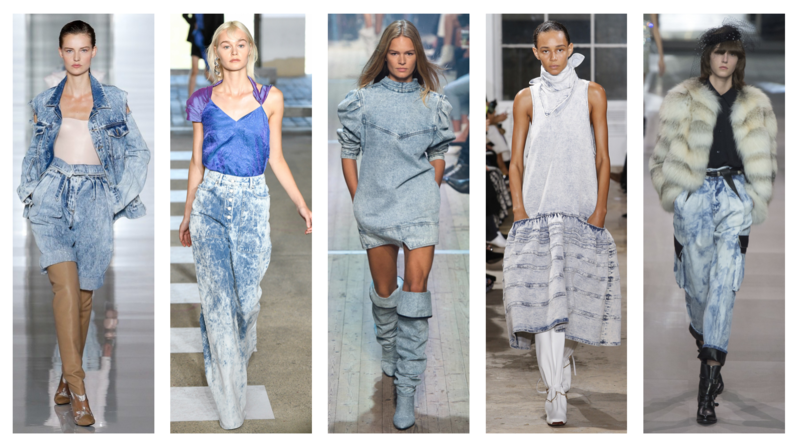 So it came as no surprise when bleach speckled patterns started emerging across S/S 19 global catwalks – starting at Proenza Schouler in NYC, then popping throughout Europe at shows like Isabel Marant, Christian Dior, Y Project, and Balmain. And its not just on the runway either, street style stars and celebs alike are getting in on the 80s acid action with names like Bella Hadid, Margot Robbie and Katie Perry all spotted in the throwback finish. If you can’t wait until next summer to get your hands on some snow wash, we recommend rummaging thrift stores for some classic looks from original 80s brands like Closed denim or Guess. There will be no getting away from upcycled elements next season: from Seventies-era crafty quilt patchworks to spliced remakes and hybrid constructions, a destroy and rebuild theme swept through the spring collections. This isn’t about homespun looks of yesteryear, though, rather high-end take on artisanal handiwork. A look that has gradually emerged over the last couple of seasons, ss19 is certainly set to be the summer of the practical pocket. From bellows volume to military-inspired shapes; jackets, overalls and jeans are all being given the oversized functional treatment with this very 90’s styling cue. The must-have statement jean of the season is undoubtedly the cargo jean, a look that emerges from the move towards 90’s and 00’s irony. But its not just edgy brands such as Vetements and Matthew Adams Dolan tapping the look, polished catwalks like Christian Dior and Celine created sophisticated versions of cargo and Alberta Ferretti feminized utility with soft pastels. Some of you will hate this one but that means you are over 35 and you need to come to terms with the fact that you are getting old…because everything you love to hate about the early noughties is coming back! It doesn’t mean you’ll have to wear it, this trend is emerging on the younger designer runways such as Telfar, Gypsy Sport andBerlin upcomer Ottolinger. Think midriff exposing hipsters, skin-revealing cut-outs, inventive and frankly nasty ‘denim art’ and plenty of dressy destroyed denim. Even Junya Watanabe channelled Brittany Spears in ‘that’ 2001 blue carpet moment, WITH a tribal tattoo mesh long-sleeve top. 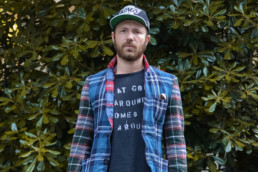 As fashion begins to edge away from the hoodie-and-trainer years, a group of leading voices push toward a new intellectual message that sees denim intersect with the process of dressmaking. 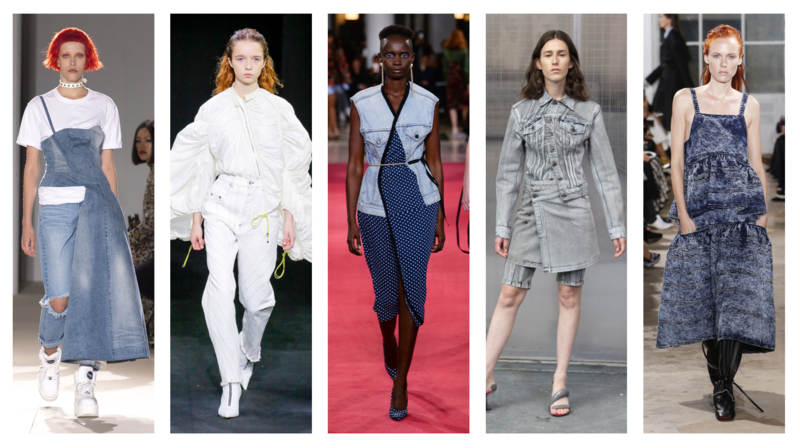 Junya Watanabe took the lead with his brilliantly refreshing collection that saw him chop up acres of different kinds of denim as riffed away crinolines, bias-cut dresses, and lingerie. Watanabe’s mood for reevaluating couture processes and fantasies of lost elegance chimed with the likes of reconstructionists Lutz Huelle, who furthered their remix design ethos through sophisticated cuts, while Muiccia Prada made a case for the denim dress at Miu Miu. This expert pattern cutting extended to more street ready shapes at Mugler and Ottolinger who offered up razor sharp seam contouring on jeans and denim jackets. We talked about cargo; utility’s latest evolution. But the workwear trend is certainly not dead after hitting runway a couple of years ago. Now a denim and casualwear staple, workwear looks have evolved season on season from classic 40’s to stylised and minimal 90’s. This season takes a cue from the biggest recent-retro theme to sweep fashion: the 80’s and 90’s. Oversized, skater looks at House of Holland tapped a gender-neutral, laid-back 90’s vibe whilst the feminised and cinched-in looks of the 80’s Isabel Marant show conjured a Ralph Lauren-esque update. There was even a late 90’s upsized story at the king of volume, Matthew Adams Dolan’s presentation. The moral of the story? True vintage is out, recent vintage is in. Fashions preoccupation with icey-blue vintage denim, has meant that printed denim has been on the back burner for quite some time. But in world where statement dressing and eye-catching looks drive numbers on instagram, its made a strong case for printed denims comeback. 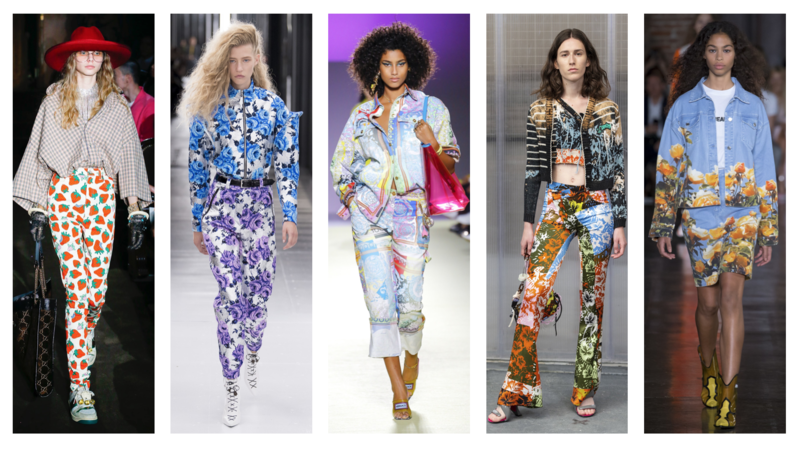 Now, prints should be worn all-over, clashed merrily and madly with little concern for what goes with what. Gucci set the tone in Paris with kitschy strawberry repeats and that iconic portrait of Dolly Parton; MSGM picked up the print pointer with a collection of photo-real florals; and Versace offered up their classic baroque prints for those customers buying into Italian ostentation. Rodeo Remains… for its last season? We’ve seen a lot of exaggerated western looks over the past few years and there’s been debate over when the fashion ranch would close for the season. Well it seems that the Fall of 2019 might just be our final ride. Crisp and clean raw looks at A.P.C. and Toga felt smart and sophisticated, while the dramatic frays and tassels Victoria Thomas and Etoile Isabel Marant lent a more playful approach to the trend. And how about that patchwork dress at Coach which evokes those iconic 70s East West Musical Instruments panelled leather jackets. 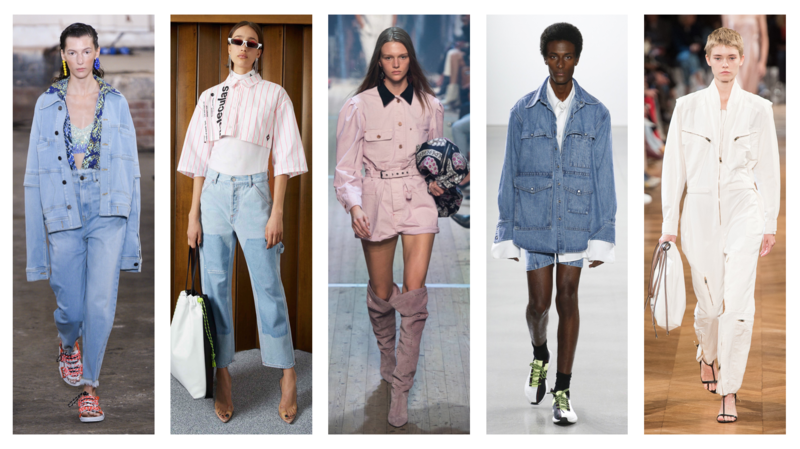 For brands looking to get a full analysis on catwalk trends and key silhouettes that will inspire the market for S/S 19, get in touch with the Denim Dudes team via the contact page.